I have to come right out and admit that I can’t take complete credit for this one. The design, styling, and sewing was all me, but the idea was from a little friend… literally. I work at an elementary school and I’ve always enjoyed working with kids because there’s never a dull moment. I’m the adult that’s a little more informal- impromptu dancing, going down the slide, inside jokes, etc. Nicknames are also big. I’m known by many kids as “Bob.” (I’m female and my real name is Syreeta). When they write my name on drawings or cards, it says Bob. When they have a question, they call me Bob. When they ask of my whereabouts, they inquire about Bob. My boss and coworkers know this, some parents know this… I also answer to this. It started almost 3 years ago and there’s no use in shaking it now. “Bob the Builder” is my theme song and often sung by a small, casual children’s choir. Side note: I am the only adult there with a nickname. For elementary students, they’re a very intelligent bunch. One day, I wore my hair down and curly (I have locks so it looks especially coiled) and one kid took notice. He glances up and goes, “Bob, you look like Medusa.” The rest is history. This was perfect! 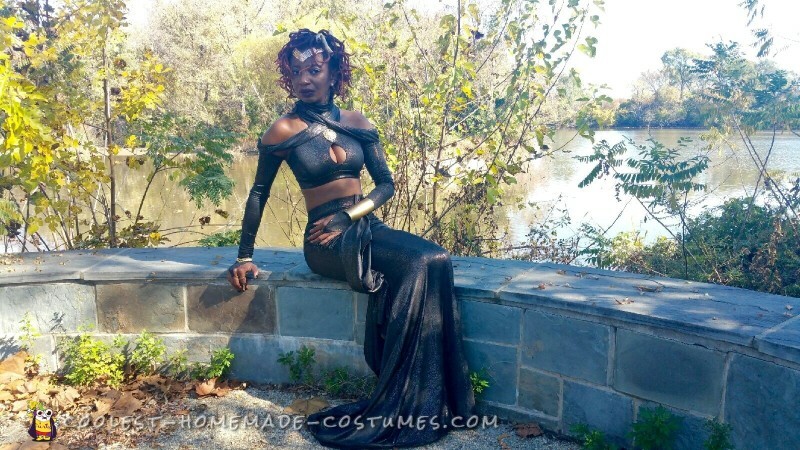 I’m a fashion designer and seamstress… I love Halloween (Last year, my friend and I went as Fred and Wilma Flintstone and I made both costumes), I specialize in custom garment design. This had to happen. Not to mention, I’m not the girliest of girls; I love a little grunge and edge. Medusa was just perfectly perfect. As for design, I like being relatively comfortable (and warm in October) balanced with femininity. 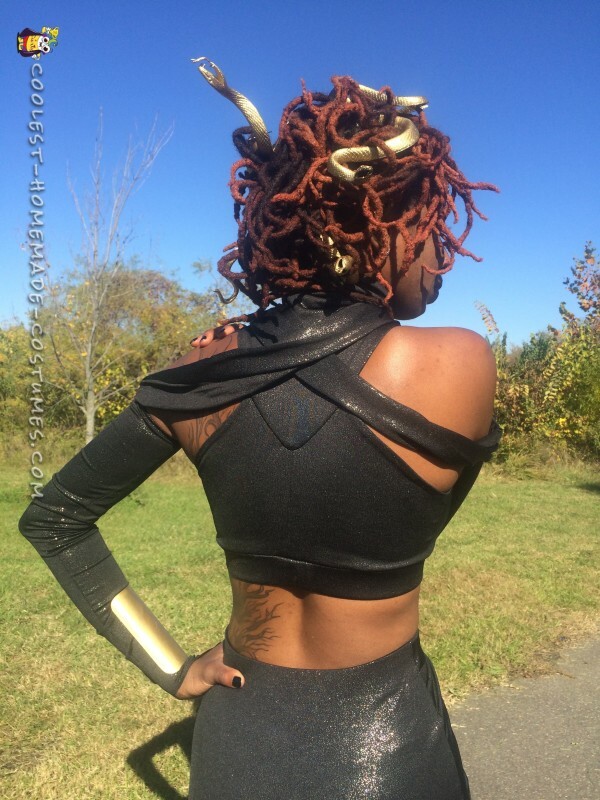 Medusa is often depicted as just a head, so I had a bit of freedom with the garments. I went through what I had on hand (budget!) and chose a spandex that was black with a gold sparkle. A maxi skirt with a little drape for Greek reference, a turtleneck because I love them, and arm sleeves for good measure. 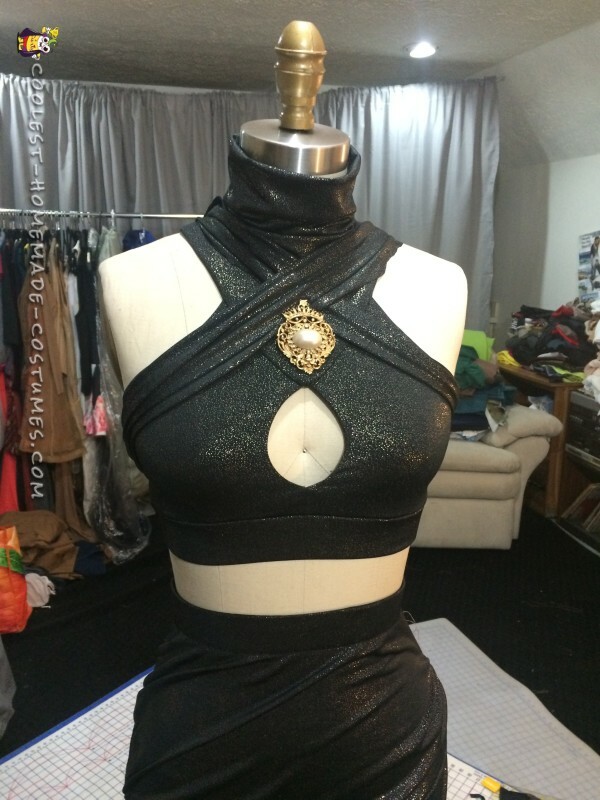 The sleeves are attached to two drapes that cross over top of the crop top and are removable. 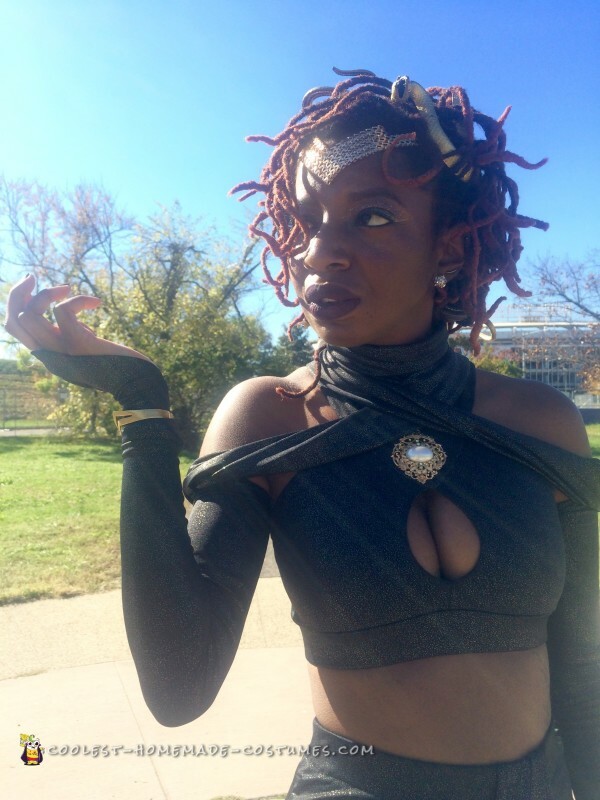 Since I’m an independent designer, it was important that I could break this look down and still use it as wearable garments- a costume that could have more longevity. I grabbed the brooch from a local thrift store, along with the cuff. The cuff was originally silver so it was blasted gold along with some rubber snakes. Ironically, the snakes were the most difficult part. I left them for last, thinking they’d be an easy find, but wound up driving around for 4ish hours to 8 or so stores before I found them. I passed a pet store in the midst of this and joked that I could have found real snakes before the fake ones. My head piece was a cheap beauty supply store necklace (win!). As I worked, I dropped hints on snapchat and twitter since this was such a fun project! 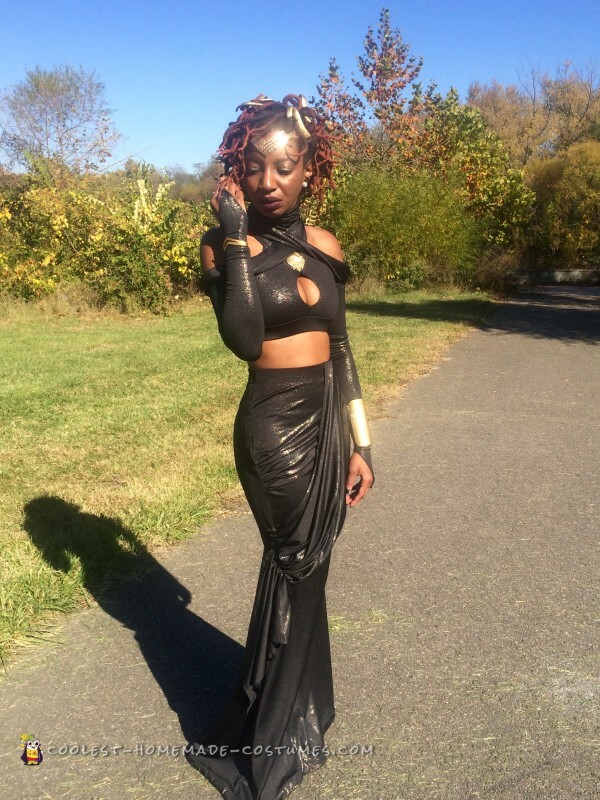 My hair was curled and pinned up and around my gold snakes, a little makeup was added, and Medusa was alive! I wore her from the neck up to the school’s Halloween parade and it was a hit. (I credited my student each time, of course). Parents down to some 1st graders would run off shouting that they weren’t allowed to look into my eyes. This continued to Saturday night when I wore the entire costume out. This was mixed with compliments on my hair to inquiries on if I made the clothing. Overall, Medusa was a monstrous success! … And people wonder why I love working with kids. The fun never ends! Check out more of my work on Instagram @SyreetaCFashion. Here I am outlining my sewing process! Like most sewing projects, I began this one late at night so I decided to do the easier part first. 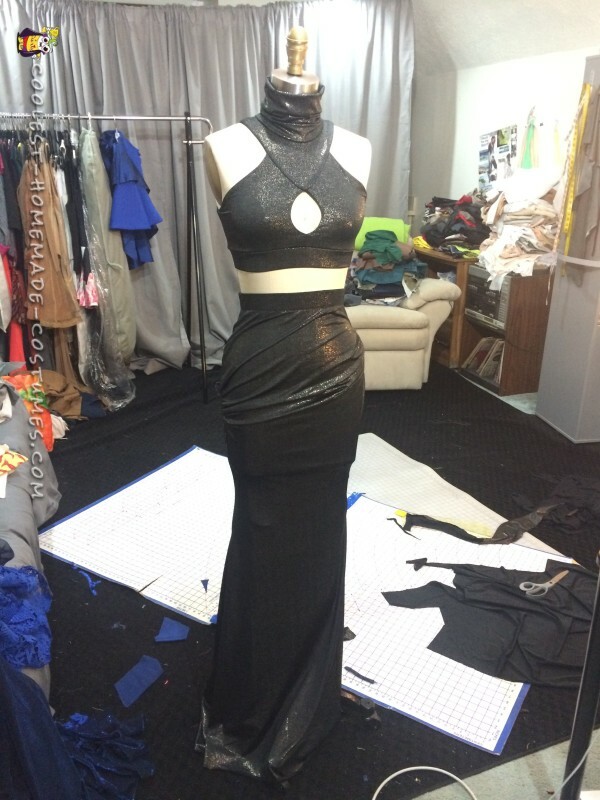 It all began with draping the skirt and the fabric went straight to the dress form. I added a bit of ruching to the front and kept the back clean because I was working with little fabric to spare. I love sets so I knew I wanted to make a skirt and top (I tried to come up with an idea for pants because I’m definitely a pants girl, but I bit the bullet and made it a maxi skirt). The skirt was designed to be high-waisted to balance out the crop top and for a more flattering silhouette. The crop top came next. Fabric began running low after this but I played with the idea of a criss-cross drape. This is when I decided to add them to the arm sleeves instead. This would not only hold the criss-cross down over my shoulder, but also add for a great removable dynamic! You can also see what it looks like without them in my mirror selfie (haha) as I try it on! 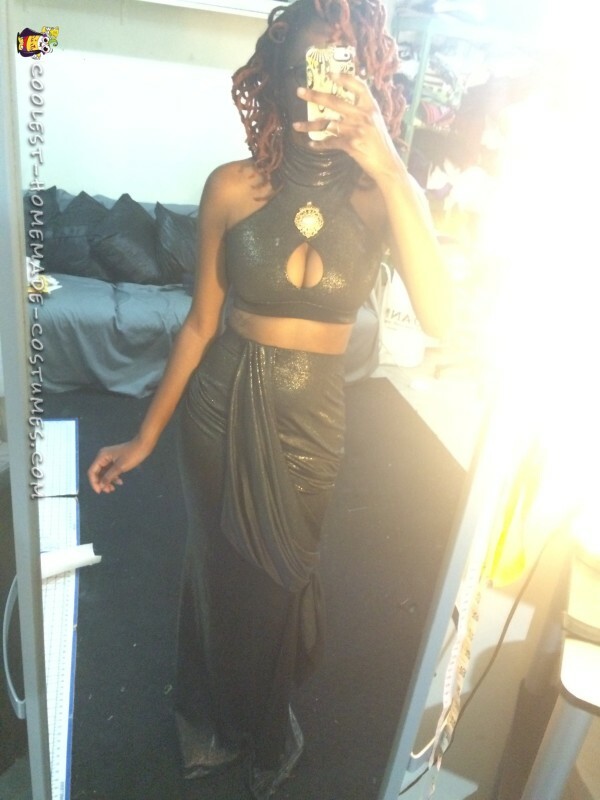 The final asymmetrical skirt drape came at the very end. I had just enough fabric left once I finished the sleeves. 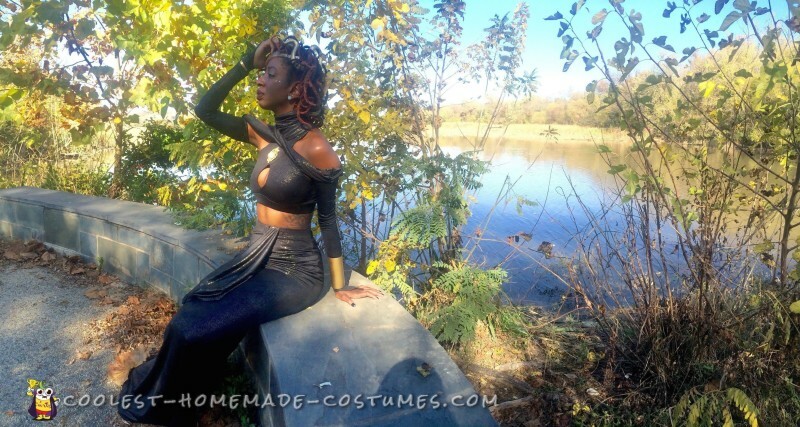 I absolutely love that this is still something I can wear or put in a photoshoot after Halloween winds down! 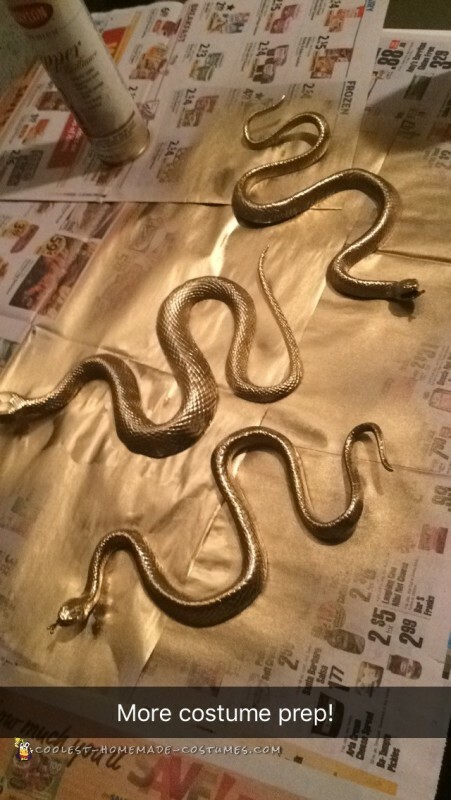 As soon as I wrapped up the sewing and found those snakes, they received a coat of spray paint before being wound into my curls. I actually thought I would run into some challenges getting them to stay in but bobby pins did the trick, even if it meant using a trillion of them. Ironically, all portions of this project that I assumed would be easy were a bit harder and vice versa. Typical sewing… but always with a rewarding outcome!